This Wednesday, there were solemn Masses and other celebrations throughout Poland commemorating the life of Pope John Paul II on the third anniversary of his death. A national poll conducted by the Polish newspaper Rzeczpospolita shows the day has become more important than the nation's Independence day. This year, for the second year in a row, the magazine Zeszyty Karmelitanskie (The Notebook of the Carmelites) is honoring the late pontiff with poems written by Catherine Hamilton of Portland. Hamilton, a member of the Cathedral parish, met John Paul in person while she and her husband were on a jubilee year pilgrimage to Rome. The trek was organized by the Archdiocese of Portland and was led by Archbishop John Vlazny in October 2000. Like many Catholics, Hamilton says that Pope John Paul had a profound effect on her life. The poems, she said, were inspired by her deep gratitude for his service to the faithful around the world. After the pope's death on April 2, 2005, Hamilton spent the next 17 days writing poetry. That happened to be the exact number of days between the death of Pope John Paul and the election of Pope Benedict XVI. The poems chronicle the poignant days before and after the death of the 264th pope. At the end of the seventeen days, Hamilton had a collection of 48 poems. "Now the dog is crying for a bowl of fresh water. Waves of sadness drip from the fringed shawl covering my existence. Fear Which is at the Beginning is my favorite. where the body and soul go. The poet's Funeral Mass is the day after tomorrow. and with him, a scroll, a face veil, a rosary and a small bit of dust from Wadowice." Included in the collection is a poem Hamilton had written and sent to Pope John Paul on the 26th anniversary of his election to the Chair of Peter. Before attempting to publish the 48 poems in a collection entitled Nine Days, Hamilton first sent them to Cardinal Stanislaw Dziwisz, the longtime secretary of the late pontiff who is now the Archbishop of Krakow. She wanted his blessing. The cardinal replied promptly. Inside the envelope stamped priority mail, Hamilton found a photograph of Cardinal Dziwisz with Pope Benedict XVI — and a letter. In the letter, the cardinal expressed feelings of great responsibility in being called to join the cardinal circle. He sent his blessings and asked for prayers. 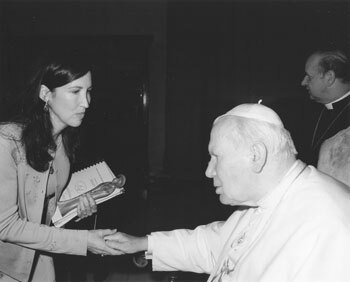 About the poems, he said that he found them very interesting, writing, "I hope that you will find the publisher in Poland to publish your poems dedicated to the Servant of God John Paul II." That was easier said than done. The poems were written in English. And while Hamilton can make herself understood when visiting Poland, thanks to Berlitz, she's a long way from fluency. But in the past year, five of the poems have been translated into Polish. Two were published last year and three are set to be published in Poland this spring. Hamilton is now in the process of submitting the entire collection of her poetry to publishing houses in Poland. Hamilton's author's copies of Zeszyty Karmelitanskie, in which her first two translated poems appeared, arrived last year on May 18, Karol Wojtla's birthday. John Paul, who would have been 87 that day, is known for saying: "With God, there are no coincidences." Hamilton agrees that serendipitous events such as this belong to the mystical realm of the Christian life. In addition to the two poems by Hamilton, the Polish quarterly contained poems written by St. John of the Cross, printed both in his native tongue of Spanish and in Polish, numerous essays and an arts gallery section that featured portraits painted by Polish painter, Stanislaw Baj. Zeszyty Karmelitanskie is a Catholic magazine of art, culture and religion published in Poznan, Poland. Hamilton's paternal grandparents immigrated to the U.S. from Poland in 1911. But it wasn't until 1997 that she made her first visit to the tiny village of Harta where her grandfather was born. "It was then," Hamilton says, "that everything Polish in me came alive." Since that time, much of her writing, fiction and non-fiction, has focused in some way on the land of her cultural heritage. Most recently, she wrote a chapter for the book Forgotten Survivors, a collection of eyewitness accounts of Polish Christians who suffered at the hands of the Nazis. Hamilton's chapter tells the true story of one of her Polish cousins who was captured by the SS and was taken from Poland to Germany at the beginning of World War II. It was three years after her first trek to Poland that Hamilton met the Polish pope. Hoping that she might get the chance to speak with the pontiff, she had memorized a traditional Polish greeting. Now, recalling that day inside the pope's private library, she said it was a good thing she had something put to memory. "Being in the presence of the Holy Father rendered me otherwise speechless," she said. It was a high point in her life — something she will never forget. Seeing her work printed in Polish, she says, "Is both exciting and humbling. It's something I never dreamed could have happened." It's Saturday at 12:30 in the afternoon on the second of April. to watch the wisteria bloom nonchalant along the arbor. aloof, thriving on other winged things. until the cobblestone inclines the pilgrims to be quiet. Everyone knows this kind of thing happens only in Rome. Giovanni Paolo Magnifico! Santo Immediato! Cathedral bells in Paris toll 84 times. In Poland they sing sacred hymns a'kapella.